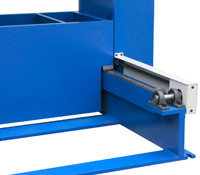 Our Hydraulic Roll-In Table Press provides premium features at competitive prices. Built around a stationary frame, the moveable roll-in table makes heavy-duty jobs a breeze. 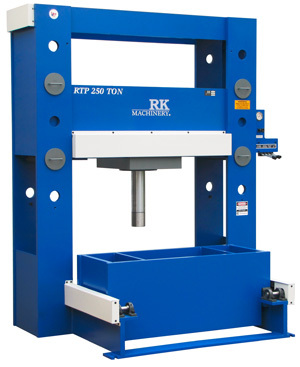 With its powerful 4 axis control, this hydraulic press is easy to use and provides all the necessary features to complete your projects with accuracy and efficiency. Add to that the fact that our presses are manufactured using easy-to-find components here in North America, and you’ve found a reliable and heavy-duty press you can count on everyday. Need more information? Take a look at the 250 Ton Roll In Table Press spec sheet, or the 150 Ton Roll In Table Press spec sheet to find out more. Our hydraulic presses are manufactured in North America. Because we operate locally we provide our clients with heavy duty hydraulic presses and the advantage of being easy to repair and safe to operate. If for any reason you experience a problem with your press, we are here to help. And in the event that you need to replace a piece, each part used in the design of our presses is easy to find in your local hydraulic repair shop.